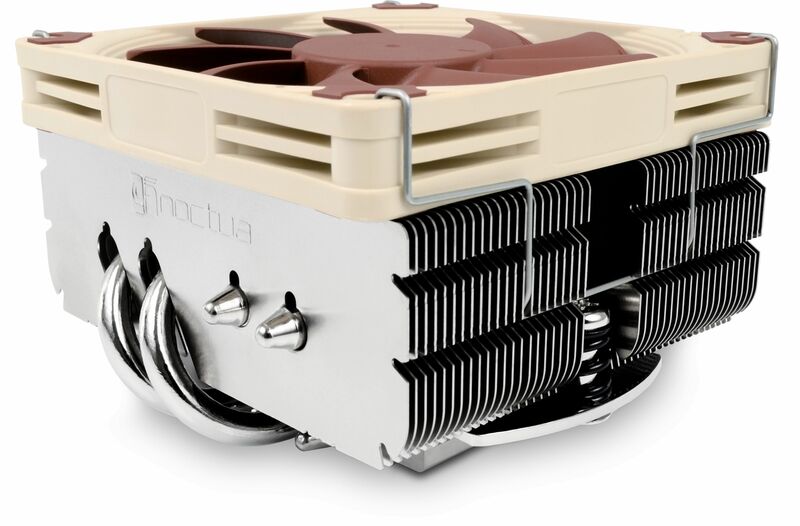 Noctua's NH-L9x65 stands just 65mm tall and is ideally suited to the efficient and reliable cooling of Intel's and AMD CPUs where a low profile CPU cooler is required. The NH-L9x65 is a taller, performance-enhanced version of Noctua’s award-winning NH-L9 low-profile coolers. With 65 instead of 37mm height and four instead of two heatpipes, the NH-L9x65 is more powerful than its smaller siblings yet retains their 95x95mm footprint, which guarantees 100% RAM and PCIe compatibility on Intel based ITX mainboards and makes the cooler more convenient to work with as it doesn’t overhang near-socket connectors. Thanks to the highly optimised NF-A9x14 premium fan that supports fully automatic speed control via PWM, the NH-L9x65 runs remarkably quiet. Topped off with the professional SecuFirm2 multi-socket mounting system for Intel and AMD, Noctua’s renowned NT-H1 thermal compound and 6 years manufacturer’s warranty, the NH-L9x65 fuses everything users have come to expect from Noctua’s larger coolers into a compact premium package for space restricted systems. Caution: The NH-L9x65 is a highly-compact low-profile quiet cooler designed for use in small form factor cases and HTPC environments. While it provides first rate performance in its class, it is not suitable for overclocking and should be used with care on CPUs with more than 84W TDP (Thermal Design Power). Please consult the TDP guide to find out whether the NH-L9x65 is recommended for your CPU. Noctua's SecuFirm2 mounting systems have become synonymous with quality, safety and ease of use. Supporting Intel LGA115x (LGA1150, LGA1151, LGA1155, LGA1156), LGA2011, LGA2066 and AMD (AM3(+), AM2(+), FM1, FM2(+)), the SecuFirm2 mounting included with the NH-L9x65 guarantees perfect contact pressure and maximum convenience on all current sockets. Complying with the open SecuFirm standard, the NH-L9x65 can be made compatible with the older LGA1366 and LGA775 sockets using the optional NM-I3 mounting kit, which is provided by Noctua free of charge. If technically possible, Noctua will also provide upgrade kits for future sockets.